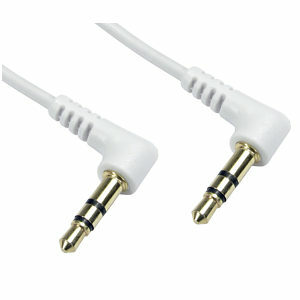 1m White 90 Degree Angle 3.5mm Stereo Jack Cable. Profigold PROA5602 2m Digital Optical Cable - TOSLink. Profigold Skyline PROA5602 2m toslink male to toslink male digital optical cable. Pearlised chrome plated metal connector with metal inner case. Superior flexible outer cable jacket. Solid black coated non-reflection jacket. 3.5mm jack to phono cable 5m, Techlink 680025 3.5mm jack to phono cable for connecting audio sources together, ideal for portable audio players such as ipod and mp3 players. Double shielded non-migratory Oxygen Free Copper conductors throughout. Strain relief adds extra durability when cable is put under extreme conditions and also prevents oxidation. Flexible PVC outer jacket to bend and fit into the tightest of spaces. High quality audio reproduction. Aluminium-mylar foil wrap provides enhanced noise rejection. 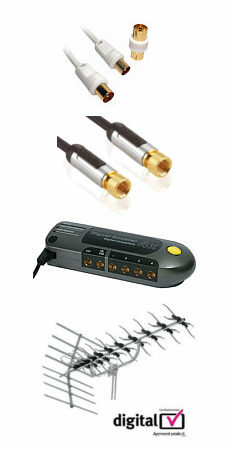 Gold plated 3.5mm jack and phono plugs for optimised connectivity and signal transfer. Advanced multiple screening against radio frequency interference (RF). What Plasma and LCD TV Annual Awards, 2006-2007: Best Cable Brand of the Year 2007. Connectors 3.5mm stereo jack plug - 2x phono connectors.